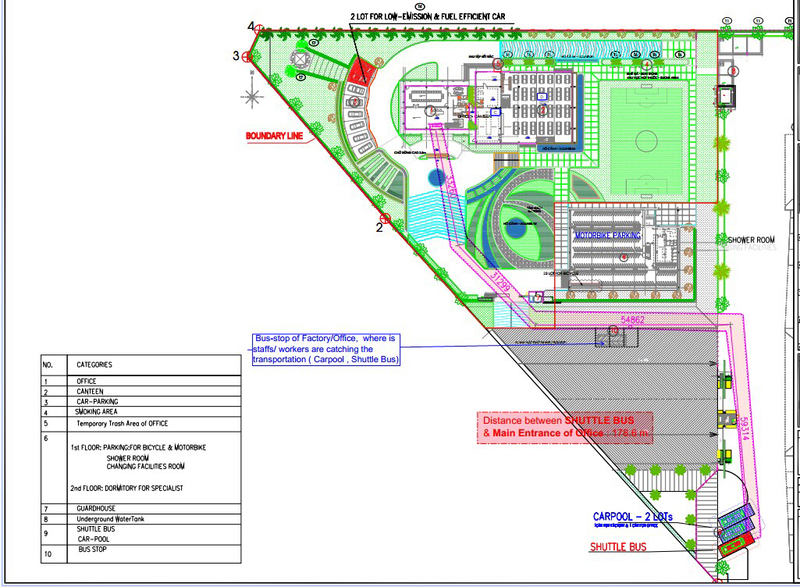 Total Square Meter 151,000 sq. Gross Square Meter 41442.86 sq. 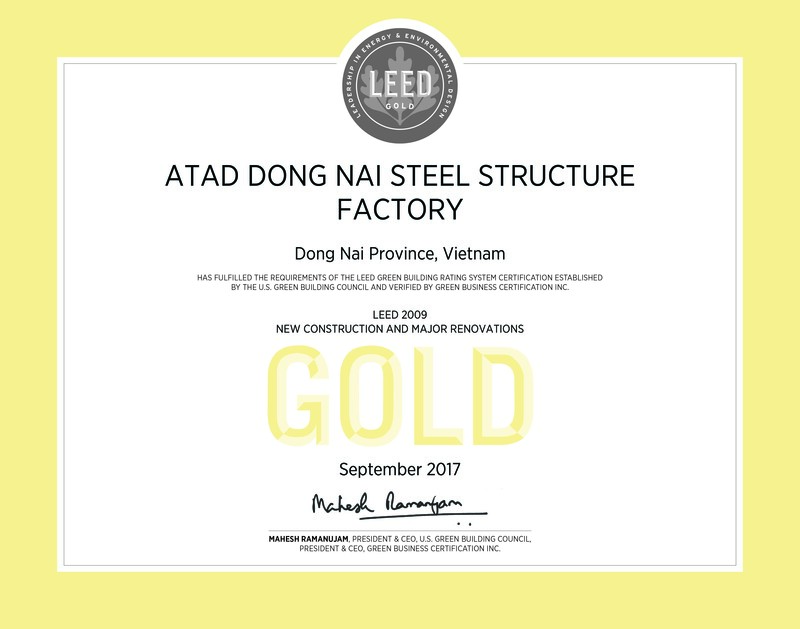 Located in Lot F, Long Khanh IZ., ATAD Dong Nai factory is designed to the US Green Building Council (USGBC) “LEED Gold” Certification which will recognize that it has met international environmental design standards. It not only has positive impacts on the environment but also result in significant reduction of operation costs. 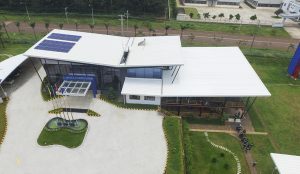 When designing and constructing the project, ATAD built an innovative green building from the ground-up and reducing energy costs. Light, air, vegetation, relaxation areas, cleanliness, functionality and regulated temperatures contribute not only to the quality of work and life, but also to creativity and the excellence of the product. The architectural project is also accompanied by investments and programs aimed at improving safety at the workplace and environmental sustainability. 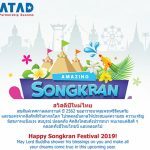 In this case study, let us introduce you highlight features which make ATAD factory become a unique green factory around the world. 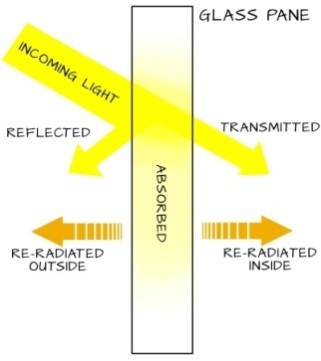 The high light transmittance coefficient allows for good day lighting harvesting and help to reduce the need for interior electric lighting, resulting in decreased energy use. A high proportion of energy use is devoted to heat control, by artificially cooling the building: good steel-based design or use of appropriate steel products can achieve a major reduction in this energy consumption. We choose bicycles as a mean of transport to travel around the factory. The purpose of ATAD bicycle storage is to promote an environment in which bicycles, pedestrians, and bus can safely co-exist. Bicycles are an efficient, enjoyable, and environmentally sound way to travel around campus, and we encourage the safe and courteous use of bicycles. We provide 18 bicycles storage and 2 areas of changing room around the factory campus. For workers working in factory, we provide the employee shuttle buses and parking spaces for low-emitting and fuel-efficient vehicles with an area of 5% of the total parking capacity. 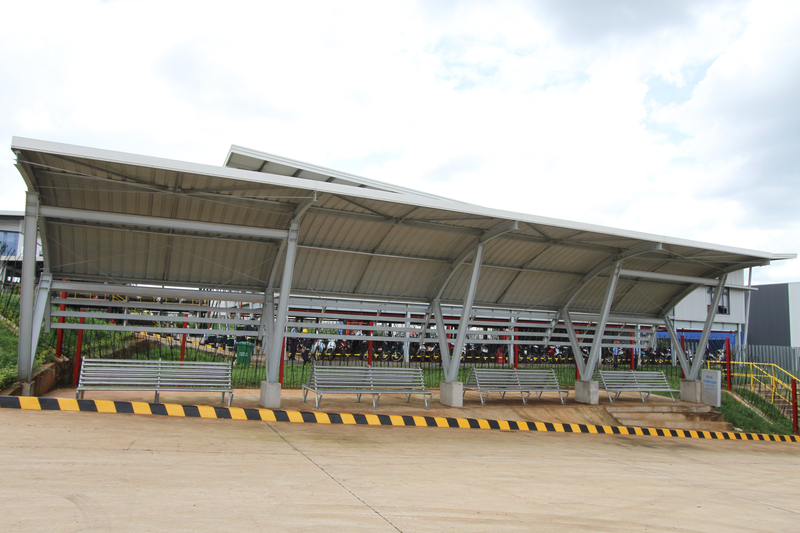 100% area of parking lot roof is made by metal roofing material with low solar reflectance. We chose COLORBOND steel panel from the famous Australian producer – BlueScope. This steel panel features Thermatech® solar reflectance technology and has a SRI value of at least 78. Sunscreen or green roof systems contribute to energy efficiency improvement by protecting from the sun or limiting heat exchanges. Thermatech® technology is designed to reflect more of the sun’s heat on hot days, which can mean less dependence on air-conditioning, plus reduced heat stress for the roof. 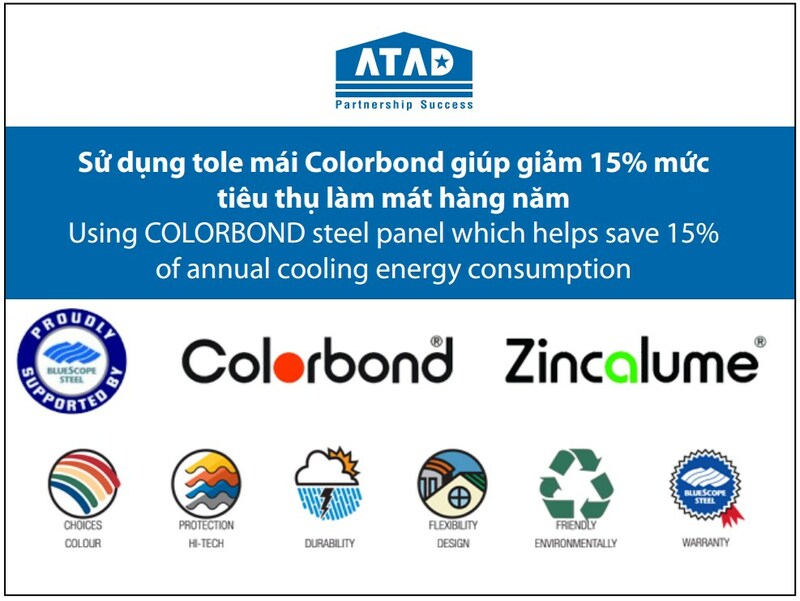 In moderate to hot climates, it can reduce annual cooling energy consumption by up to 15% as compared to roofing materials of similar color with low solar reflectance. Unnecessary outdoor lighting wastes energy and contributes to greenhouse gas emissions. Moreover, constant exposure to artificial lighting may interfere with human metabolism and sleep. 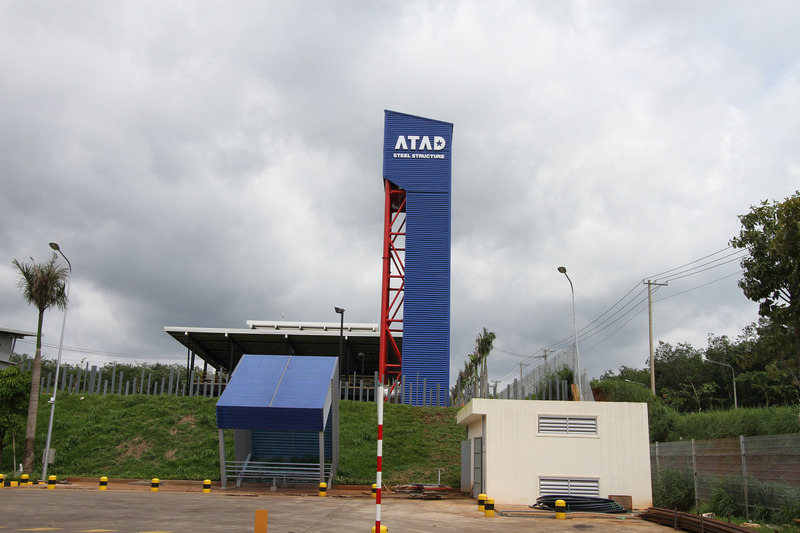 At a green factory, ATAD factory is designed and erection to reduce the light pollution as much as possible. With outside views, we replace outdoor lights with intelligently designed, low-glare fixtures. Motion sensitive switches will light up porches and walkways when we need to move around after dark. We also replace conventional high-energy bulbs with efficient outdoor CFLs and LED floodlights. We use indoor lighting controls to automatically turn lights on and off from 11pm- 5am. In ATAD, we know the importance of using water efficiently that will help ensure reliable water supplies today and for future generations. We are noted that the correct weighted average flush rate of the factory fixture group dual-flush water closet has not been used. When we addressed this issue, ATAD factory has reduced potable water use by 43.10%. For the wastewater treatment, by applying the innovative wastewater technologies including the use of high-efficiency flush fixtures and non-potable water sources, we have reduced potable water for sewage conveyance by impressive number: 416.76%. 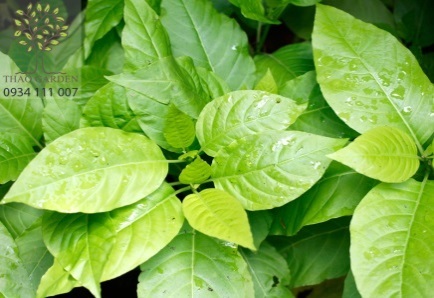 Besides that, we use only the captured rainwater system to water the landscaping by drip irrigation system. Harvesting rainwater can reduce the use of drinking water for landscape irrigation. To harvest rainwater, the project reduces the amount of impervious surface on a site by using permeable pavement surfaces on sidewalk/internal roads with a low road load. We also apply the water transportation system of our rainwater harvester by the gutters and downspouts along the edges of our roof. We installed huge underground concrete rainwater tank near the pumping station. The tank receives rainwater from ditches running along factory campus. The concrete tank is made from high frequency vibrated reinforced concrete using the highest quality of materials. It is also strong and durable. Coupled with the use of native and desert- adapted plants such as (ginger grass, sebesten fruit, bear’s breach…) with a total area of 1,478 m2, rainwater harvesting is an effective water conservation tool because it provides “free” water that is not from the municipal supply. 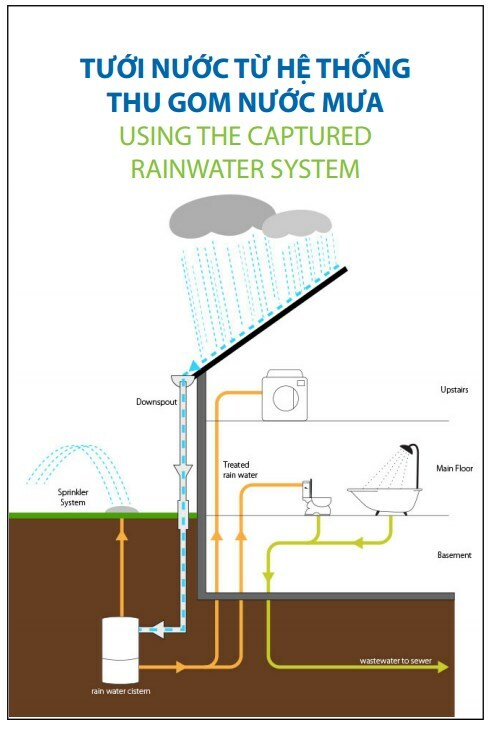 There are many benefits to harvesting rainwater. Water harvesting not only reduces dependence on ground water and the amount of money spent on water, but also reduces off-site flooding and erosion by holding rainwater on the site. 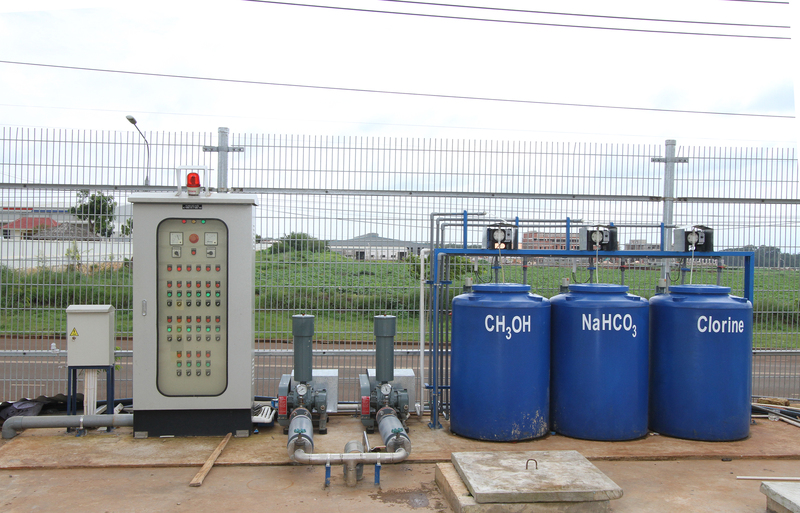 We installed a water treatment station to remove pollutants (contaminants) from industrial wastewater. It will remove all of the contaminants and make water fit for discharge back to the environment. Chemicals are used during wastewater treatment in an array of processes to expedite disinfection. This is the most common method for removing dissolved metals from wastewater solution containing toxic metals. Becoming more energy efficient is the cheapest and fastest way to cut energy bills and reduce carbon pollution. In ATAD, we reduce lighting energy consumption by using lighting automations system for indoor lighting system. Low-energy consumed T5, LED bulbs, electronic ballast and timer control with manual override switch to save energy when not in used are helpful to avoid any possible waste of energy. From the design phase, ATAD project is developed and implemented a measurement and verification plan through a network of sub-metering system for monitoring energy consumption. A breakdown of energy end uses can help determine the most effective areas for energy conservation, such as electrical lighting, HVAC consumption. 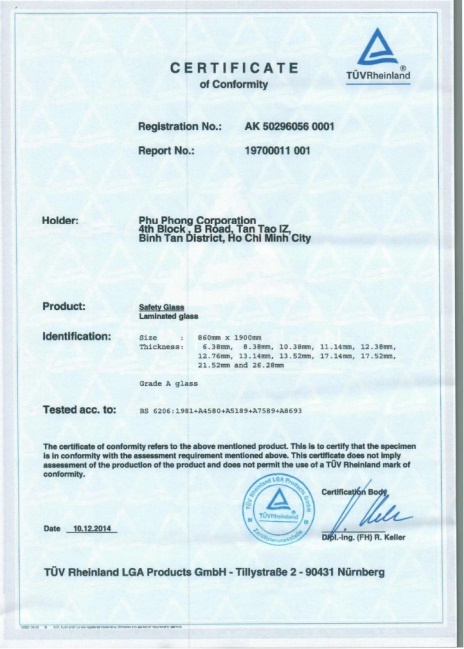 For roof system and skylight, ATAD selects the materials from trusted suppliers with low U-value to contribute reducing solar radiant come into interior building and decreasing energy lost. The exterior glazing is clear Low-E laminated glass (U = 4.1294). 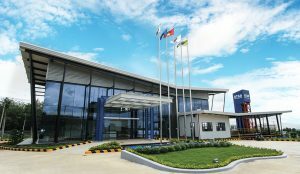 With the low solar heat gain coefficient (SHGC), the glass has a performance to block unwanted heat again entering the building, especially in hot weather in the South Vietnam. 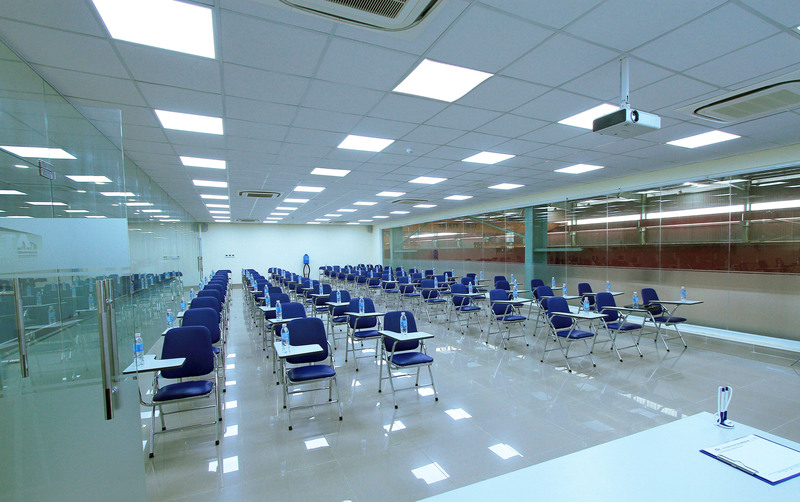 In addition, high light transmittance coefficient allows for good day lighting harvesting and help to reduce the need for interior electric lighting, resulting in decreased energy use. Our effort brought that the project has achieved an energy cost savings of 17.49%. 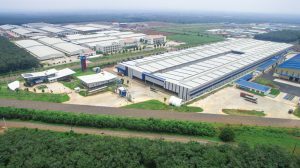 At ATAD factory, the breathing zone outdoor airflow complies with the over achieves (by 30%) the ASHIRAE Standard 62.1 – 2007, Ventilation for Acceptable Indoor Air Quality (IAQ). We applied air water cooled chiller system with a minimum coefficient of performance (COP) of 6.1, NPLV 6.4. This is a simple system to design and install as well as low maintenance cost. By using Daikin Variable refrigerant flow technology, our cooling and ventilation system can minimize efficiency losses and provide sustainable energy benefits. It automatically changes discharge air temperature according to the simultaneous loads to can save up to 32% energy. 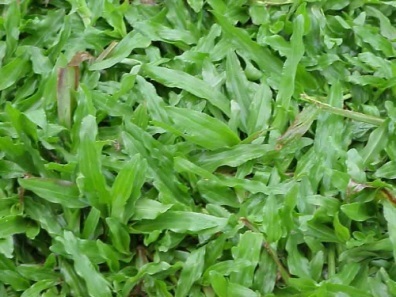 Moreover, it is eco-friendly with no CFC gases in heating, ventilation and air conditioning. 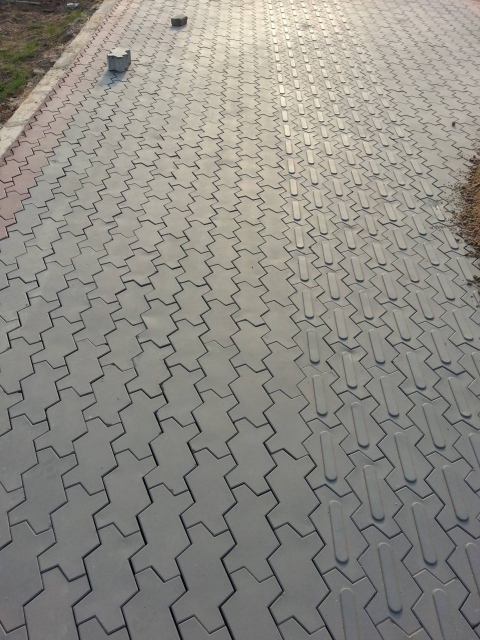 Unlike concrete, steel is 100% recyclable and is one of the world’s most reused products. 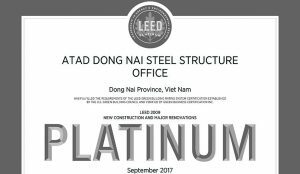 In this project, ATAD applied an optimized pre-engineered steel building system that use steel materials which are from recycled material source and the recycled content value (from steel and other materials) is achieved at least 20% of the total cost of building materials. 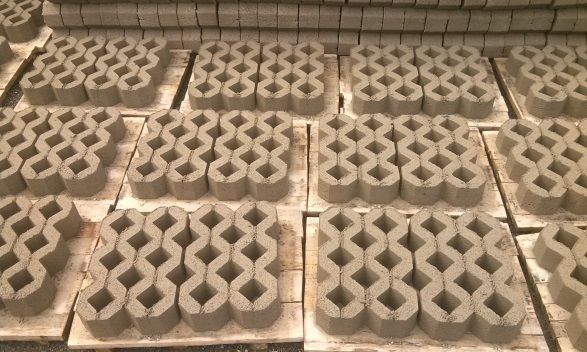 This way will contribute to reduce impacts resulting from extraction, processing of virgin materials, and also decrease solid waste volumes to landfill. 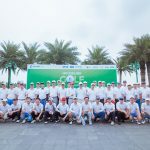 In addition, the project has provided appropriately sized dedicated areas for the collection and storage of materials for recycling within 800 kilometers of building location. Thereby supporting the use of indigenous resources and reducing the environmental impacts resulting from manufacturing and transportation. During the construction stage, ATAD Factory project focuses on construction waste management to reduce 75% construction waste onsite. This process help to divert construction and demolition debris from disposal in landfills and incineration facilities. Redirect recyclable recovered resources back to the manufacturing process and reusable materials to appropriate sites from disposal and whether the materials will be sorted. ATAD has noticed that the sorting of waste is becoming increasingly important. Our target is separate as much useful waste as possible and deal with it in the most appropriate manner. Waste is collected at its source in each area and separated. We also installed the Waste Transfer Station after canteen area. In a factory, indoor environmental quality (IEQ) is so important. IEQ affects worker productivity. The Environment Department at Lawrence Berkeley National Laboratory has found that improved indoor air significantly reduces illness and has a positive impact on worker productivity. Researchers estimate that workers’ performance would increase between 0.5 percent and 5 percent due to improved indoor air quality. ATAD factory is mechanically ventilated and that the ventilation system has met the requirements of ASHRAE 62.1-2007. In fact, the breathing zone outdoor air ventilation rates to all occupied spaces has been increased by at least 30% above the minimum rates required by ASHRAE 62.1-2007. That means ATAD factory always provide pure, fresh air for staff which not ensures everyone health but also helps increase the productivity. ATAD factory design also reached other amazing achievements in daylight and views-daylight index. Over 97% of all regular occupied space achieves daylight luminance level between 25-500 fc Lumieres when in a clear sky condition. 99.31% of all regularly occupied areas achieve a direct line of sight to the outdoor environment via vision glazing between 76 and 229 cm above the finished floor. Maximizing daylight within these areas reduces the need for electric lighting within the building, which, if integrated into the overall approach to lighting, can result in decreased energy use and contribute to conserving natural resources and a reduction in air pollution. 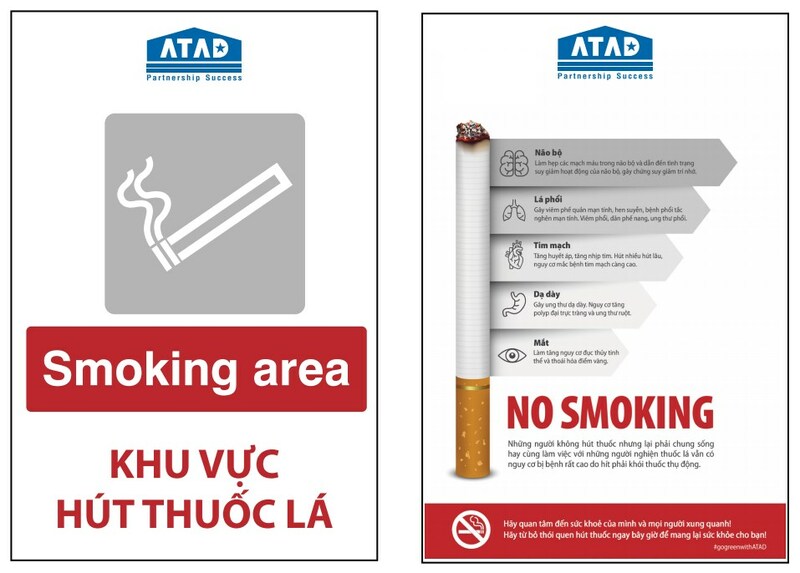 In ATAD factory, smoking is prohibited within 25 feet of entries, outdoor air intakes, and operable windows of factory. We have put no smoking signs in these areas and set up the smoking area outside the building and factory. Copyright © 2004 - 2019 ATAD Steel Structure Corporation. All rights reserved.